Terrapin Beer/Facebook Terrapin Watermelon Gose: Pretty psyched about this new release from Terrapin Beer. Sea salt, coriander and watermelon for a tart summer beer that’s just 4.3%. Phoenix Ale Brewery/Facebook Phoenix Ale Brewery Watermelon Ale: A wheat beer with “watermelon essence” added during fermentation. It’s subtle, and sessionable, the way all watermelon beers should be. New Belgium New Belgium Heavy Melon: Take your standard, subtle watermelon ale and add a bit of zesty lime. It’s the newest seasonal from New B. and I gotta say, I’m digging it. Leinenkugel/Twitter Leinenkugel Watermelon Shandy: A recent addition to Leinenkugel’s shandy lineup, adding the fruit to the blend of Weiss beer with lemonade. Because why the hell not? Horny Goat Horny Goat Watermelon Wheat: Horny Goat is all about fruit beers, offering an Apple Brown Ale, Pineapple Hefe, Pumpkin Ale, Tangerine IPA…and this Watermelon Wheat. Ballast Point Ballast Point Watermelon Dorado: Forget wheat beers and session ales, Ballast Point gives a double IPA the watermelon treatment, with the fruit acting as a balancing act for the hop profile. It’s 10%, people. Anderson Valley/Facebook Anderson Valley Briney Melon Gose: This is a new one. Sea salt, coriander and watermelon. Hell yeah. If you see my wife out at a social event, there’s a good chance she’ll be holding a watermelon. My better half always, and I mean always, brings a watermelon to the party. Doesn’t matter what that party is. A bar mitzvah, a high school graduation, a funeral…she’s showing up with a watermelon and a giant knife to slice that fruit up into chunks. It’s one of the things I love about her. So she gets really excited about this time every year, when breweries release their seasonal watermelon beers. She calls it “Watermelon Beer Season.” She even does a little dance. The Watermelon Beer Season Dance. And this year, my wife has more beers to choose from than ever before. Several big craft breweries have released watermelon beers recently, which means this summer might be the juiciest ever in my household. 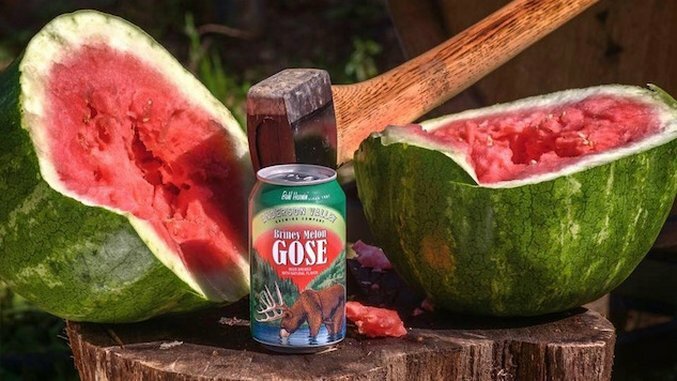 Here are seven watermelon beers you need to experience this summer.